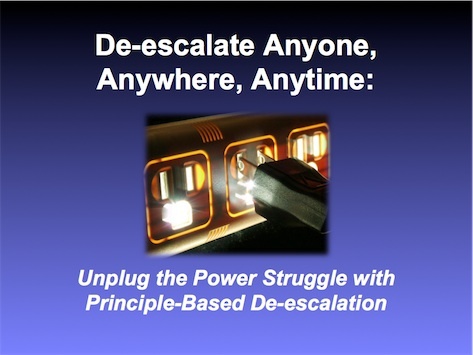 Can You De-escalate Anyone, Anywhere, Anytime? Is it really possible to de-escalate anyone, anywhere, anytime? Yes! Imagine yourself dealing with any scenario with anyone, anywhere, with confidence and long-term foresight. This is possible with a Principle-Based approach to de-escalation. Firstly, What is Not De-escalation? Always remember that someone who is escalated is under stress and not likely to think clearly. Trying to force the situation to resolve as to how and when you want it is not likely to de-escalate that situation. This is not a good time to expect the escalated person to easily engage in learning, problem solving discussions or debriefing the situation. De-escalation is all about helping and improving a situation. It is not about making it worse so avoid any actions which will escalate the situation. What that might be really depends on the circumstances and the people involved. Well, could just about any action make the situation better or make it worse? The fact is that something that works for one person or in one setting may not help all others. reduce the intensity of (a conflict or potentially violent situation). When you de-escalate someone or some situation, you act to improve the situation (and not make it worse.) Your intervention might be something you do, something you say or even choosing to do or say nothing. Just about anything could be the right response. You definitely want to avoid the wrong response. The wrong response can make the situation worse! "One Response Does Not Fit All"
Note: This is a continual process. Continue to re-assess the situation in order to respond effectively. Whether you improve or worsen the situation or make no impact at all, you will only be able to have the right response when you continually assess and respond accordingly. A common misconception of de-escalation skills is that you can learn a specific technique and it will always de-escalate the person in front of you. 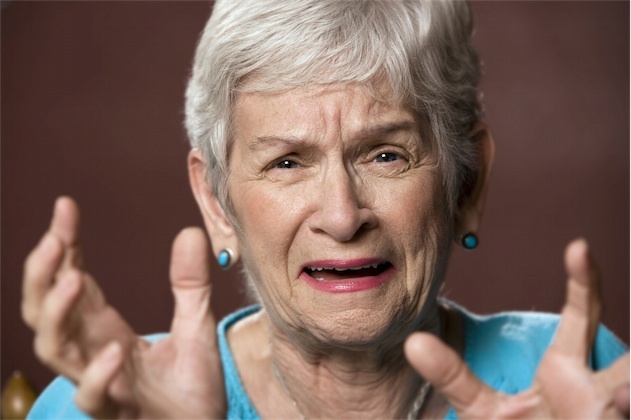 It is not uncommon to hear people say, "I usually do _____, but this one time it didn't work." The same technique will not always work because different people have different needs. You can even take the same two people and the same issue and the situation may resolve differently on a different day. You will be most effective when you can adapt in the moment to the needs of the person you're trying to support. The only response that works every time is the right response for that specific situation. Good question! There is no "little black book" of phrases that you can just conjure that will make people de-escalate. If everyone is so different that all have different needs, how is it even possible to de-escalate anyone?!? What you need are Universal Principles which apply to any age person, any level of ability or disability, and any setting. A Principle-Based approach to de-escalation is effective because it guides you in any situation, no matter who you deal with. You have to take care of yourself in order to help anyone else. Learn more about the importance of Self-Care. Am I in control of my Stress Level? Is this situation something that I can deal with at this time? Am I the right person to intervene? What have you noticed about your stress level during a conflict? How would you adapt your paralanguage to the situation? How might you use the 3 Guiding Principles in your response? How would you see the situation from their perspective or experience? So what if the person is upset? When is it okay, or is it ever okay to be upset? Do I need to respond? Do I recognize if the person is able to manage the demands of the environment? What if I am by myself? How is the team's communication? Does the team know the plan? Do we recognize when there is a power struggle? "The workshop taught me the importance of safety and how to be safe in different situations. Also not to be so bold and to understand and listen to others."